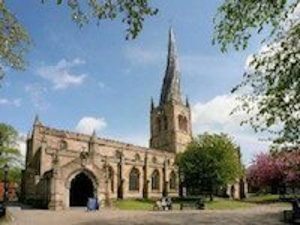 Welcome to the Chesterfield and District Family History Society. We are here to help you discover your family heritage. Not simply to find the names, key dates and places of birth or death of your ancestors… Learning about the history of your family is a fascinating and often surprising voyage of discovery. It is a never ending process which does involve the key genealogy facts and figures, but also leads to an understanding of how our forebears actually lived. What it was like to work on the land, or in the industries which changed forever both the landscape and the living conditions of almost everyone from the 18th century onwards. It is about getting to know long gone family members. We can accompany you on your journey of discovery, whether you are just beginning or if you are an experienced addict. There is much to be found on this site to guide you, but we encourage you to get in touch, join our friendly group and to learn from the experiences of our members. Once you join us, you will have access to even more information on this site and through our support network. If you have questions or would like to learn more, then please contact us and we’ll do everything possible to help you. It is believed there has been a church on this site since about 1250. Parts of the current church date from the 14th century. The North Transept was rebuilt in 1769, and was further restored in 1843. The building is grade 1 listed. Parish records survive from 1558. Most are available on microfilm from LDS Family History Libraries. Bishops Transcripts are also available. Records are held at the Derbyshire County Record Office. Parish records are the most useful sources for discovering your family history before the 1837. They’re basically birth, death and marriage records created in local churches — going right back to the time of Henry VIII. It became a legal obligation to register all births, marriages and deaths. UK census records reveal complete family groups, together with occupations, addresses and more. Recorded every ten years from 1841, and available to 1911. All you need to begin your voyage of discovery. All members can advertise their own surname interests online. All members receive a regular newsletter via the member pages of this site. Society news and articles of interest to all family historians. We meet regularly to learn from one another. Speakers present specialist subjects related to our interests. Participate in detailed case studies prepared by other members. Submit your own studies for the benefit of all. Member library containing extensive resources to aid your research and presentation. The Society exchanges magazines with many other family history societies for the benefit of members. Chesterfield & District Family History Society aims to be one of the country’s leading and most forward thinking ‘Family History Societies’. Providing a strong base to enable our members to develop and grow as ‘Family History’ researchers. We aim to foster a positive experience and environment, through creative and innovative, and related services for our members.